The Beginning Rancher's Wife | …never too late to learn something new. The sun is just starting to at least cast a glow through the heavy clouds and snow. I look out the front window and it’s hard to tell how much snow has fallen so far because the wind has been blowing all night. I can’t see the horses in the corral so I’m assuming they are huddled together in the barn stalls and oh boy, there will be some digging out to do out there so that we can get those doors shut again. 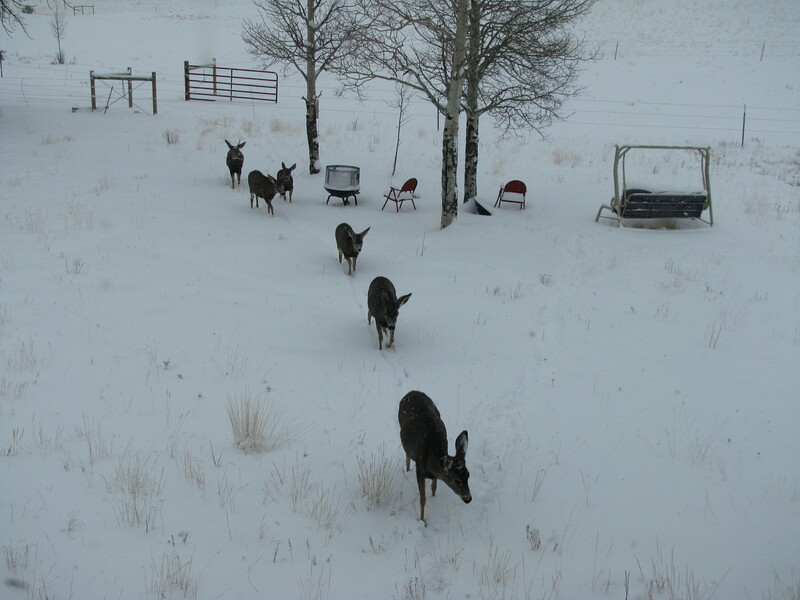 Our best guess is that we have 8-9 new inches on top of the 6 that was left over from the last storm. They are predicting another 6-10 throughout the day today. It looks like it is going to be a very white winter here this year. Not complaining….all this moisture will come in handy during the summer dry season when our state has been so plagued by fires. When Jeremy and Jessica had Emma we made it to the hospital in Los Angeles just in time. As I walked in, Jeremy came out to get me. I was shocked. They wanted me and Jessica’s mother in the delivery room. Now I couldn’t have done that in a million years…but I’m OH SO GRATEFUL that they desired that. I was a bit unsure of myself when I walked in and just quietly watched, listened and helped as each opportunity arose. And when Emma finally arrived, I felt an overwhelming sense of awe and gratitude. Awe that God had allowed another precious little one to join our family…awe at the miracle of birth…awe that my son was now a daddy….gratitude that momma and baby were both healthy…gratitude that I had been able to be a part of the whole experience. There weren’t any words for the way I was feeling. And, I was still quiet…because there were no words. Birth has always been kind of a quiet experience for me. It’s such a miracle. For the momma, it takes alot of concentration and work. The daddy is quietly giving comfort and reassurance. At least that was my experience all four times. I wanted the room and the atmosphere quiet and peaceful. When our first son was born we had Christmas music playing…Handel’s Messiah to be exact. He (John Michael) wasn’t due until January 3rd but he arrived on December 20th…on our second wedding anniversary. John Michael and Windy’s “Little Lane” is due on December 23rd. So excited! It’s really kind of surreal that that they are having a baby so close to the time when John and I had our first son….who is now going to be the daddy to “Little Lane.” It’s made me pretty reminiscent…and once again filled with awe and gratitude. God has surely blessed our family. We have had our fair share of struggles and trials. At times, I think both John and I thought we had MORE than our fair share of struggles and trials. But when I see the family that God has blessed us with…starting with the heritage that comes from my precious mom and John’s amazing mom and dad, to our four boys, to their spouses and now to grandchildren…all I can feel is awe and gratitude. Those that don’t know me very well see the “work” that I do with Artios…and I love what I do believe me. But honestly, all I ever wanted was a husband that loved me unconditionally, who would raise our children to love God and to want to live to glorify Him, and children who would seek after God with all their heart, all their soul and all their mind. As I watch that reality, I am filled with awe and gratitude. As I’ve grown older, my dream expanded to include spouses for my boys…spouses who would also love God with all their heart, all their soul and all their mind and then, who would love my boys with everything inside of them…who would complete them. As I watch that reality, I am filled with awe and gratitude. Now, as God is blessing us with grandchildren, my dream expands yet again. I want for them the greatest gift of all…a personal relationship with the God of the Universe. I pray for that even now! and that’s why they call it grace…it is unmerited. Awe and Gratitude! Yep…that pretty much sums it up. One HUGE trip to the grocery store…followed by one EXTRA-LARGE trip to the same store, and I still came home with out 2 cans of sweetened condensed milk for the very important pumpkin pies. Now I could certainly go without pumpkin pie. I literally hate the texture of pumpkin pie…BUT, I have one son whose Thanksgiving is not complete without pumpkin pie and A LOT of it. Realizing I didn’t have the sweetened condensed milk, we began searching all the cupboards for evaporated milk. 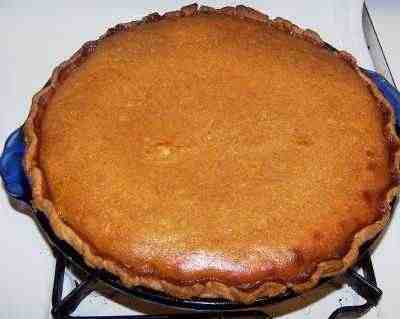 The recipe did say that I could use evaporated milk IF I added 1 to 1 1/2 cups of sugar to it. After searching the pantry downstairs and ALL the cupboards upstairs. We came up with one can of evaporated milk that had expired in 2009 and one can that had expired in the middle of September 2013. I threw out the can from 2009 but decided to take my chances with the can from September of 2013. This left me one can short. So, what may seem like common sense to you seemed like a risk to me but I went ahead and filled up 2/3 of the empty evaporated milk can with regular milk, poured it into the mixing bowl and added 1 and 2/3 cup of sugar…crossed my fingers and hoped for the best. In the past, given that we live at 9450 feet above sea level, up in the Rocky Mountains, I’ve had some trouble with pumpkin pies setting properly. But I am THRILLED to tell you, that despite the makeshift ingredients, these two pumpkin pies are the best pumpkin pies I have ever made and they set perfectly. When we first got married, I was petrified of cooking a Thanksgiving turkey. My experiences with turkey had not been all that positive. I used to call it the “meat made my teeth squeak”…meaning for whatever reason, I perceived that turkey was dry. Now grant it, this was MY perception and none of my other family members remember it being that way. Nevertheless, my past left me terrified of cooking turkey. THEN, the heavens opened, and this recipe fell into my lap and not only have I never had a bad turkey experience but I also have at least one person each year contact me for the recipe. So, I thought I would share it with you. It comes from a little paperback recipe book that I found years ago titled, Holiday Meals, by Sue Gregg. I must admit that I omit her stuffing suggestion and I add the pepper and garlic powder…but for the most part, I have stayed true to her original recipe. AMOUNT: Allow 3/4 to 1 lb. per serving for turkey under 12 lbs. or 1/2 to 3/4 lb. per serving for turkey over 12 lbs. 180 to 185 degrees, Roast 45-60 minutes per lb. 1. Wash turkey thoroughly, including cavities (remove neck and giblets) and pat dry with paper towels. 2. Rub the entire turkey with olive oil. 3. Salt, pepper, and sprinkle garlic powder all over the turkey including the cavities. 4. Place turkey BREAST SIDE DOWN on rack in roasting pan. 5. Place meat thermometer in meaty portion of bird, not touching bone. 6. Place in oven preheated to 300 degrees. This is very important in order to kill bacteria. Roast 1 hour at 300 degrees. 7. Reduce heat to 180-185 degrees, roast 45-60 minutes per lb. (three times the standard time per lb.) Larger birds will require the longer cooking time per lb. 8. Roast until meat thermometer registers 190 degrees. Nothing like having the “main event” complete itself overnight. I am a big proponent of writing things down in a journal. That principle applies to Scripture that touches my heart, goals that I have, things to pray about, things I have to do, and yes, things I am thankful for. As usual, I’ve fallen behind this month in documenting those things that I’m thankful for…but I have definitely been pondering it. Sometimes when you read lists like this, from the outside looking in, the list can appear trite. But, I assure you…these are all things for which I am eternally grateful. I did Days 1-3 in the last post…so, I’ll begin with Day 4. Day Four – I am thankful and amazed that God reached down and saved me…saved me when I had nothing to offer and nothing good to bring before Him. Day Five – I am thankful that God made each of my sons so unique and different from one another because He had unique and different callings and purposes for each of them. Day Six – I am thankful that I am getting “older”…. (notice I didn’t say “old)…because with growing “older” comes the ability to look back and definitively see God’s hand at work…orchestrating each and every event in my life. Day Seven – I am thankful that I have the ability to work in ministry/business with my family. Day Eight – I am thankful that my children love their God and are seeking His face. Day Nine – I am thankful that God has allowed me to live in the state of Colorado…the state that brings me the most peace and contentment…and that I can be surrounded by such incredible evidence of God’s creativity each and every day. Day Ten – I am thankful that we finally have a church in our area that we can attend knowing that God’s word will be preached each and every Sunday. Day Eleven – I am VERY grateful that our third son, after struggling with illness for several years, appears to be on the upswing. Day Twelve – I am SO grateful for my mom and the sacrifices that she made so that I could have such an incredible educational experience and training growing up. Day Thirteen – I am thankful that I have a piano in my home on which I can practice and through which I can communicate with some of my deepest emotions. Day Fourteen – I am thankful for the team of people that God has put together in the ministry of Artios Academies. Day Fifteen – I am thankful that God brought Windy to my son John. She is his perfect completer…and a wonderful addition to our family. Day Sixteen – I am thankful that God brought Jessica to my son Jeremy. She is his loving helpmeet…and such a joy to watch as a wife and mother. Day Seventeen – I am thankful for our granddaughter Emma…and for the joy she brings to each of us as we experience life anew through her eyes. Day Nineteen – I am thankful for the new grandbaby that will join us in March. Day Twenty – I am thankful for John Michael and the way he has allowed God to use him in the lives of young people as a positive influence and role model….and the way God has used him in our lives as an encourager and a colleague. Day Twenty-one – I am thankful for Jeremy…for his desire to do the right thing and for his strong and determined spirit to be what he needs to be to his wife and children…and the way God has used Jeremy in our lives to inspire and challenge. Day Twenty-two – I am thankful for Jordan…for his teachability and his strong desire to follow God’s leading in his life no matter what the cost…and for the way he has been willing to walk alongside us through good times and bad…and for him being such a great big brother to Jared. Day Twenty-three – I am thankful for Jared…for his constant joy in every area of life…for his excitement and enthusiasm…and for the way he desires to study Scripture in depth and on his own at such an early age. Day Twenty-four – I am thankful for my “in-laws” and the way they have welcomed me into their family unconditionally…and for their friendship and guidance over the years. Day Twenty-five – I am thankful that God supplied an office space for us to have outside of our home so that we could have the work space we needed without it invading our tiny house. That catches me up…but I assure you…I could easily write more. God has been faithful to me…even when I have not been faithful to me….and for that…I am also grateful. This week there won’t be a “Cooking with Grandma” post as I’m traveling and interacting with 140 kids from the various Artios campuses while we are all attending the High School Fine Arts Competition in Greenville, SC. But, hopefully, I’ll be back up on that series two weeks from today when I’m back home and in my own kitchen again. In the meantime, I wanted to publicly do what I’m privately doing during the month of November and that is to each day focus specifically on different things that I am thankful for. It has been said that one can’t be worried or anxious if one is focused on having a heart of gratitude and thankfulness. I have been trying this consistently over the past couple of years, and although I am far from perfect at doing it, I do know that when I put the principle into practice, it does prove itself to be true. The following are in no particular order. Once again, I’m writing in “stream of consciousness” style. Day One – I am grateful for the balcony people in my life. These are those people that instead of negatively criticizing or complaining about me consistently inspire and cheer me on. It’s like being on the “playing field” and looking up in the stands and seeing a group of people specifically cheering and encouraging you. That means SO much! Day Two – I am grateful for a husband that has been and continues to be my number one “balcony person.” It takes a strong man to lead a strong woman. So thankful that God provided me with a man that has what it takes to lead me and while leading to also be an encouragement to me. Over the years, I’ve seen alot of examples of men that were looked at as “strong leaders” simply because they had strong and sometimes even overbearing personalities but i I never saw them demonstrate servant leadership or the type of leadership in the home described in Scripture as “loving your wife more than your own body.” So very thankful to have a husband who is a strong man who wasn’t scared off by a strong woman. He has raised sons that are demonstrating that same type of leadership in their own homes and lives…which makes me doubly grateful. Day Three – I am thankful that God gave me a passion to work with and around young people and that every day of my life, I am given the opportunity to use that passion. I probably won’t post every day this month…but will try and post from time to time and share with you the things I am thankful for as we lead up to Thanksgiving. Since I’m new to this whole “hobby” thing, I think that my posting on the site in the area of “Cooking with My Grandma” will probably only be once a week. With life being so fast paced, travel for Artios, and two grandbabies coming, I think once a week is something I can be consistent in. 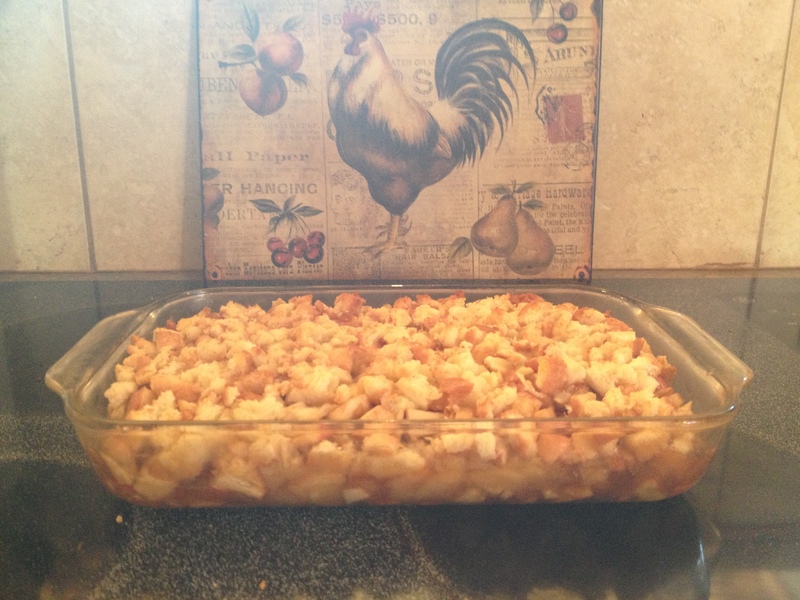 SO today, I’m baking Apple Brown Betty. 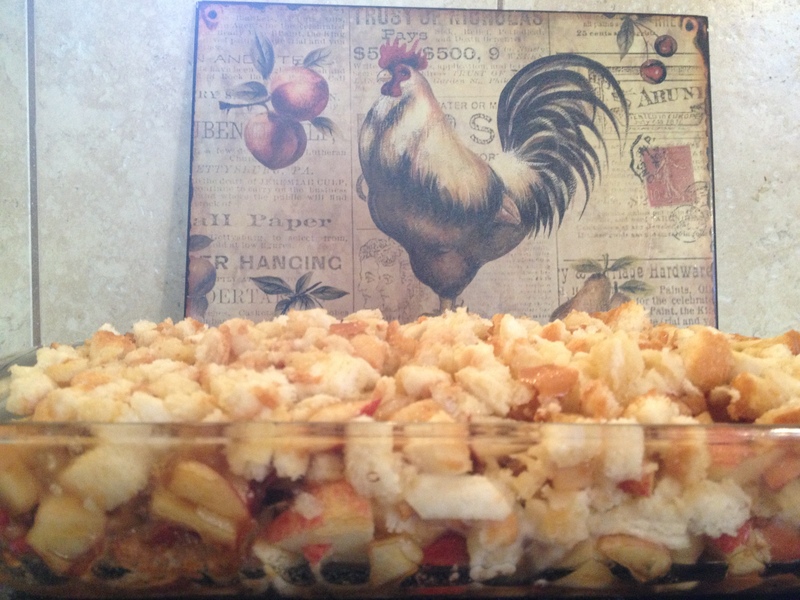 It looked easy, quick and had ingredients that almost everyone has on time all the time. 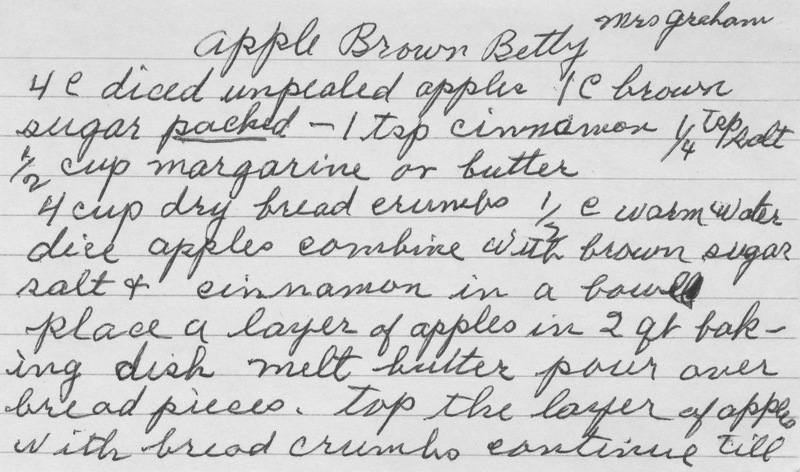 I hadn’t really heard of this dessert before seeing it in my great-grandmother’s handwriting on a piece of paper. So, I looked up a bit of history of the dish on delish.com. Although the history was still a big vague, the recipe appears to have been around for quite some time. 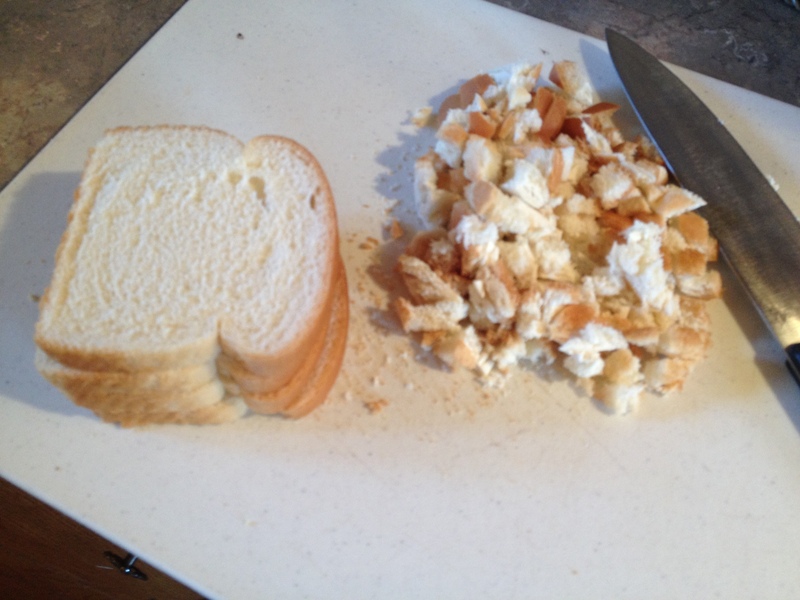 First thing I did was chop up the bread so that it could dry out some while I was doing the rest of the dish. Here in Colorado, things dry out quickly so I didn’t have to wait long. 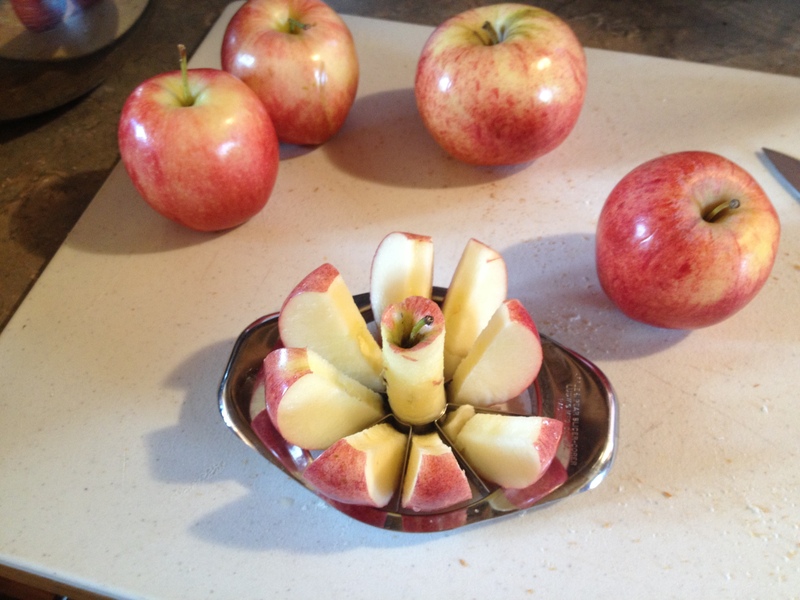 I then used my apple corer to core and slice the apples and then chopped and diced them up with the peel on. This recipe said to leave the peels on, so I did! I melted a stick of butter in the microwave for about 40 seconds and then poured it over the bread crumbs that I had drying in a bowl. I also added the brown sugar, salt and cinnamon to the apples that I had sitting in a separate bowl and mixed all of them together. 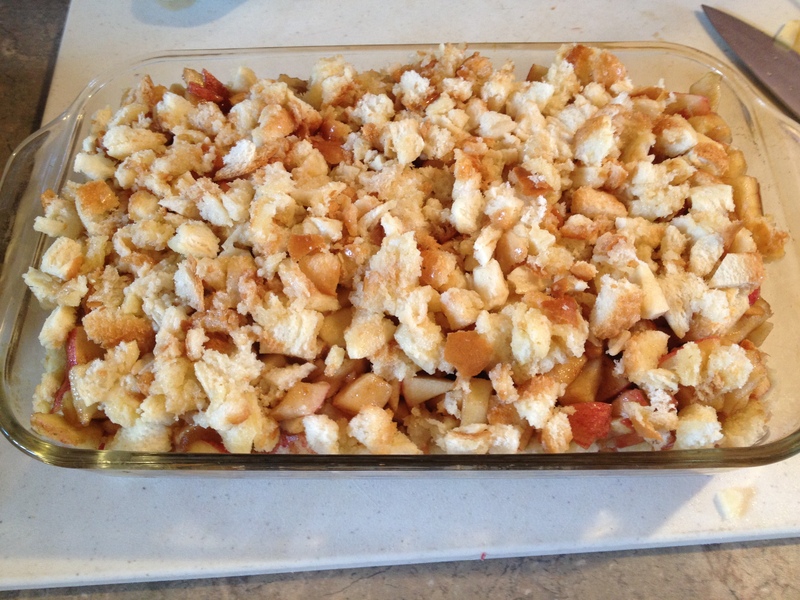 In a 2 quart baking dish, I put a layer of apple mixture, followed by a layer of bread crumbs and repeated this until the dish was full. Then, I poured the 1/2 cup of lukewarm water over the entire dish. Then I slid it into a 350 degree preheated oven and set the timer for 40 minutes. It was easy, inexpensive. 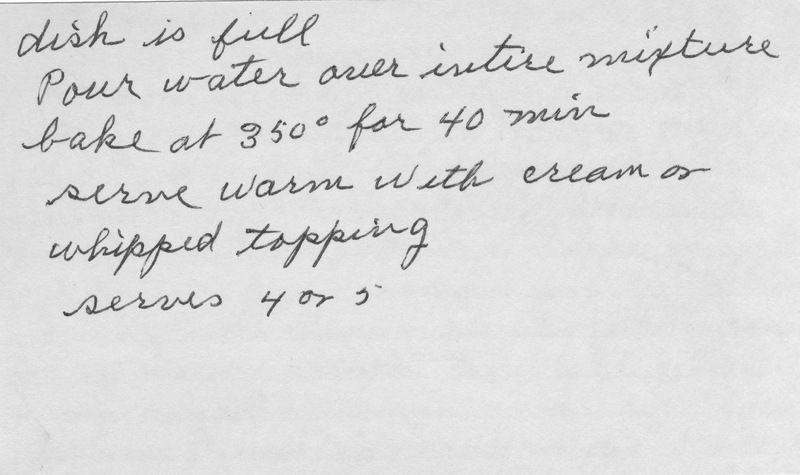 I have a feeling my great-grandmother probably did made this recipe quite often given how frugal it is.